Although President Obama authorized airstrikes in Iraq to ensure the safety of American diplomats in Erbil, the U.S. military targeted two areas more than 30 miles southwest of the city. The reasoning behind the attacks could include more than just protecting Americans. 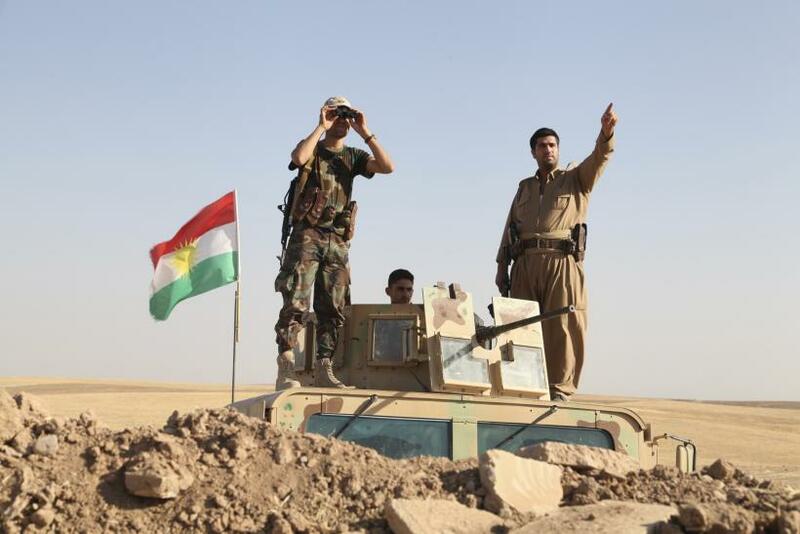 U.S. warplanes targeted a district, Makhmur, and a town, Gwer, that sits on the edge of the district, because militants associated with the Islamic State of Iraq and Syria (ISIS), a Sunni group now operating in large swaths of land in the country, have taken control of them, threatening the security of nearby Erbil. But the two towns are more than just a strategic location. They offer a main transit route from the north to the south, and are in some of the country’s richest oil lands. The U.S. has a vested interest in securing the areas not only because they sit in close proximity to Erbil, where American diplomats are stationed, but because they were home to some of the most skilled U.S. soldiers and high-tech weaponry during the Iraq war. Those weapons were then given over to the Iraqi military following the U.S. withdrawal from Iraq. Some of that weaponry, according to sources on the ground and analysts, could have fallen into the hands of the Sunni militant group. “It’s feasible because we had bases all around there and we turned a lot of them over,” Austin Long, a professor of international affairs at Columbia University said, adding that several of the forward operating bases the U.S. handed over to the Iraqi military have now been abandoned and were taken over by ISIS. During the Iraq War, the U.S. stationed a forward operating base in Makhmur, called Camp Crazy Horse. The base was home to the U.S. military’s special operation forces who played a key role in the Battle of Debecka Pass in 2003, which is referred to as the “Alamo” of the Iraq War. It allowed the U.S. military passage to the south towards Baghdad during the invasion. Makhmur, and more specifically Gwer, provide a direct pathway from Kirkuk to Mosul, allowing ISIS to smuggle oil north. According to several media outlets, the bridge linking Gwer to the Makhmur district has been damaged by the U.S. airstrikes, making it more difficult for the the Sunni militant group to transport goods. But according to the U.N., that bridge was damaged before the strikes. Beyond strategic importance, striking Makhmur and Gwer offers political advantages. It could help the Kurdish military regain control of Kurdish territory, leading to a more stable Iraq -- a goal the U.S. said it achieved when it withdrew troops in 2010. According to Long, the U.S. strikes on towns near Irbil were less about American diplomats’ safety in the city, and more about the peshmerga's, or the Kurdish army’s, control over Kurdish land. Denise Natali, a strategist with the National Defense University in Washington, said that the U.S. airstrikes could never have happened without approval from the Baghdad government. Makhmur, which ISIS took over on August 6, was formerly under the control of the Kurdish government, though it was disputed territory during the 2003 Iraq War. The district is predominantly Kurdish and inhabited by farmers, but also houses oil drilling sites. Until ISIS took it, it housed a refugee camp run by the United Nations, which allegedly housed members of the Kurdistan Worker’s Party (PKK), a political and military organization that fought the Turkish state in an armed conflict. “Turks have wanted that camp dissolved,” Natali said. Senior U.S. officials said Friday that they were not going to rule out more airstrikes in Iraq, but said no ground troops would be deployed.